Love the taste of a grilled supper? You can have it in just minutes if you plan right and follow these quick BBQ ideas. Even though summer has come and gone, there’s no need to pack away the BBQ. At least not yet. The early fall months are generally an ideal time to do a little backyard grilling and enjoy the smoky goodness of food cooked over a hot grill. Another bonus is that grilling is usually a quick and easy method of dinner preparation. You can heat a gas grill in a matter of minutes and have a fully cooked dinner ready in just a few more. 1. Make sure you have enough propane or charcoal. It’s not a BBQ if you can’t even light the fire! Running to the store for replacements will definitely extend your dinnertime — and make your family grumpy. Plan ahead. 2. Have your side dishes already to go. Cold meat isn’t as good as the stuff coming hot off the grill. Make sure your side dishes can be made a little in advance and have them ready. The grill cooks quicker than you think. 3. Brush the grill with an oil with a high smoke point. You grease a pan when you bake; be sure to oil the grill when you cook out. This will prevent meat from sticking to the grill rack and allow you to cook, flip, cook, eat more quickly. Use a high smoke point oil like grapeseed or avocado to avoid too much smoke from burning oil. 4. Choose quick cooking ingredients. Fish, shrimp, chicken tenders, kabobs, and hamburgers all cook quickly. If you’ve got a tri-tip but not as much time as a roast would take, cut it into steaks. When it comes to quick dinners, what you choose to cook is just as important as how you cook it. 5. Use a meat thermometer. Don’t waste valuable eating time overcooking the steaks. 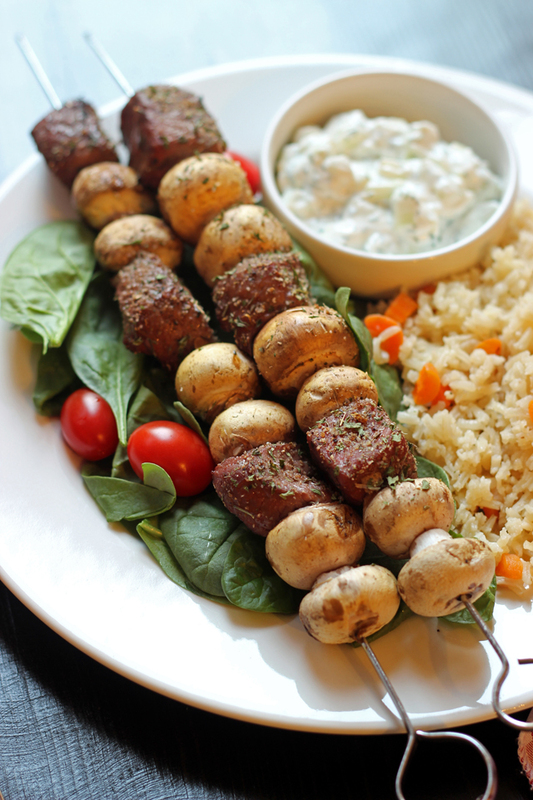 Use a meat thermometer to judge accurately when the meat is cooked. Check out this list to help you know the proper internal temperature of the meat you’re grilling. 6. Allow for resting time. Some cuts do need a few minutes to rest. The temperature list above will also let you know what resting is required, so that you can time your meal properly and not stand around waiting to cut in. Make double so you can enjoy smoky-flavored leftovers in your lunch tomorrow. Cook once, eat twice; serve it with a side of awesome sauce. 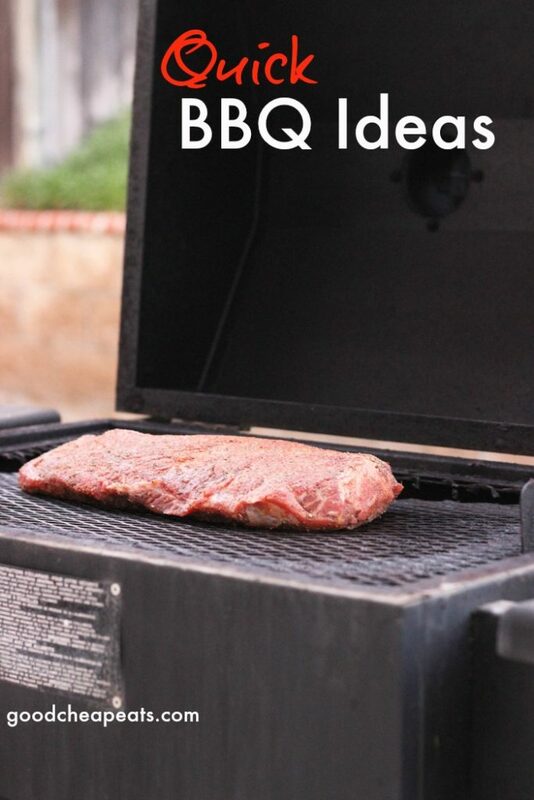 Got any quick BBQ ideas to share? Is it already cold in MT?! I’m sorry. I wish we could share the 90 degrees! I also like to grill. My tip is to grill your side with the meat to simplify things. I like to do zucchini or sweet corn. You may need to start the veggies after starting the meat since they cook faster. Also, don’t babysit it. Close the cover, set a timer and proceed with the rest of meal prep.